Dear Akin - Les Leba. Download Dear Akin - Les Leba. round tripping and support capital flight! level of N127=$1 inspite of a record level of foreign reserves. environment for industrial growth will become a reality. holdings of dollar certificate in duly registered transactions with authorized commercial banks. reserves and by extension our foreign revenue potential in the next five years or so! searching for naira will quickly improve the value of the naira significantly by up to 50% (i.e. 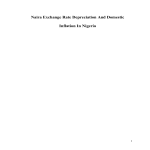 demands with a stronger naira and the attendant demand will stimulate more employment. to the charade canvassed as WDAS by CBN! supportive of corruption in the country. This column is totally in accord with this observation.